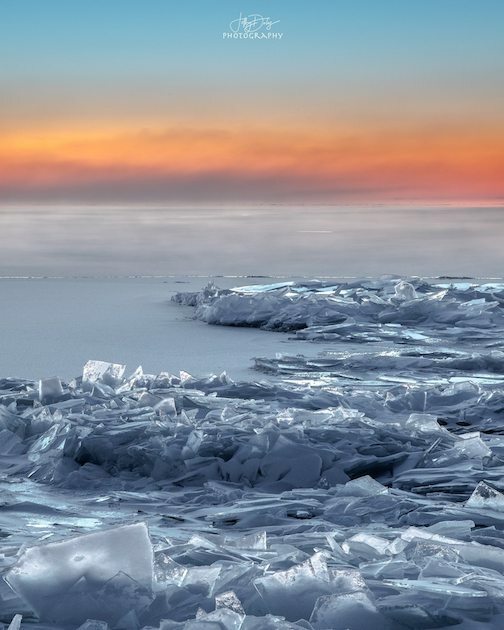 Ice Flow Cove by Christy Illig. Christy is one of the photographers who participated in John Gregor’s photography workshop at Tettegouche State Park last week. 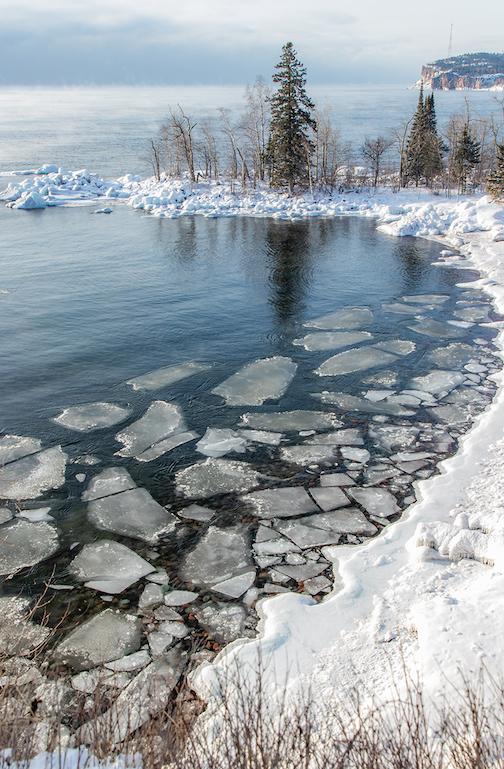 The students’ work is on view in the Great Hall at Tettegouche through February. 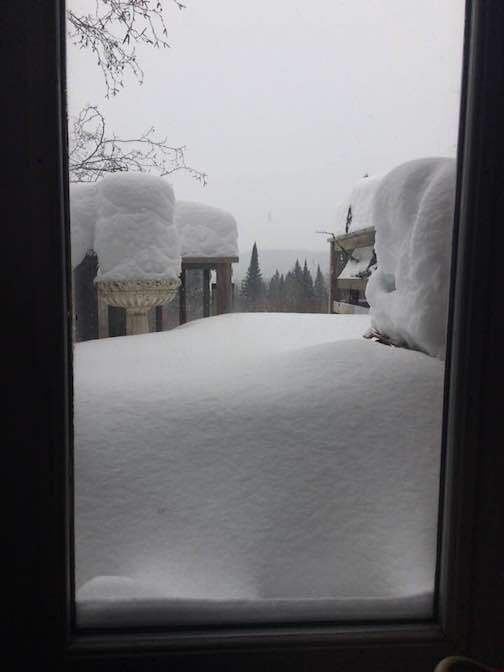 The Polar Vortex has passed us by, but it left lots of stories in its wake. It also left memories, paintings and photographs of this incredibly cold time. 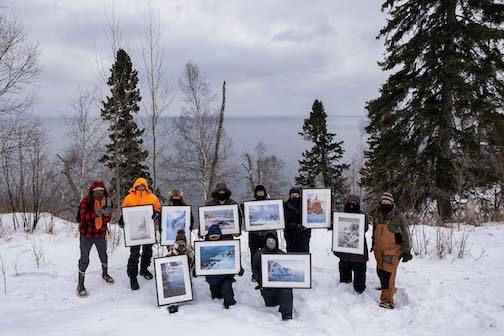 Last week, the Winter Plein Air exhibit opened at the Johnson Heritage Post with lots of paintings created in that winter cold, and a new show just opened at Tettegouche State Park. 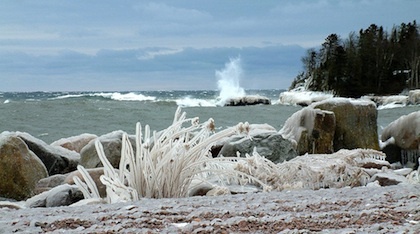 Entitled The Polar Vortex, it features photographs from nine frozen-fingered photographers who were out shooting during a John Gregor workshop. 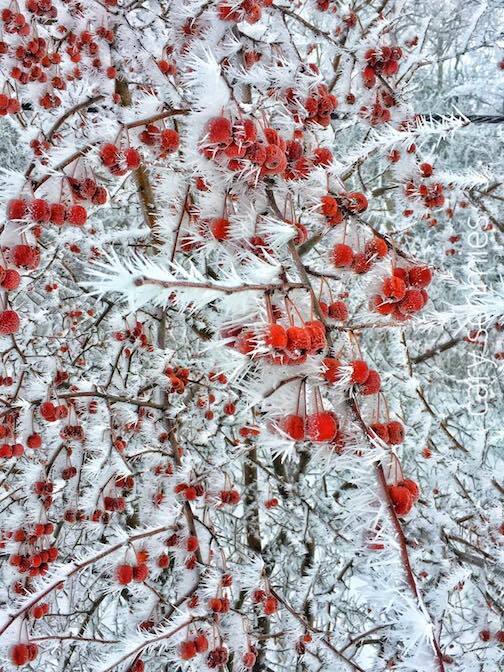 John Gregor’s Winter Wonderland workshop just happened to fall during the Polar Vortex. Nine students signed up for it. Here they are with one of their photos. 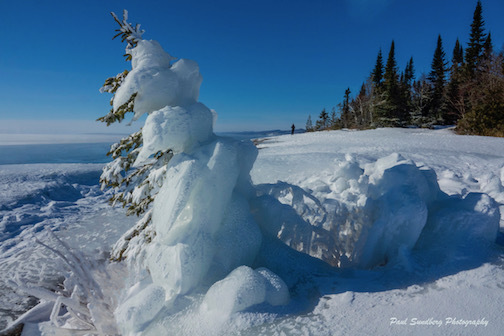 All their pieces are on display at Tettegouche State Park through March 1. Two Harbors photographer, Christian Dalbec, also helped during the workshop. 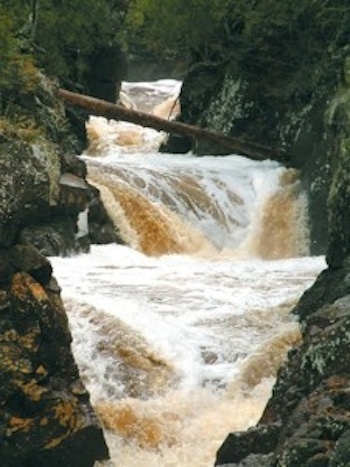 The photographs are currently on view in the Great Hall at Tettegouche State Park. A closing reception for the exhibit will be at 7 p.m. March 1. The opening reception for the Winter Plein Air exhibit at the Johnson Heritage Post was well-attended and highlighted work by 20 plein air painters, many of whom have been trekking out to YMCA Camp Menogyn for 10 years to spend a week warming up by the fireplace and then venturing out to paint in the frigid cold. 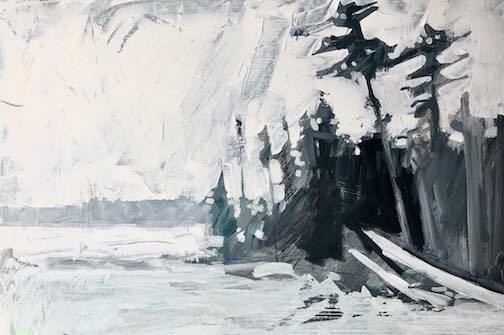 “Bright Snow” by Adam Swanson is one of the paintings in the Winter Plein Air show at the Johnson Heritage Post. The exhibit features work made during the Polar Vortex as well as others painted in the last 10 years. The exhibit continues through Feb. 24. The Heritage Post is open from 10 a.m. to 4 p.m. Thursday through Saturday and from 1-4 p.m. Sunday. There are lots of other things to see and do this week, too. On Thursday, North House Folk School will screen the film of the winter season. “The Islands and the Whales” is a powerful film about the Faroe Islands and whale hunting. The pilot whale hunters of the Faroe Islands believe that hunting is vital to their way of life, but when a local professor makes a grim discovery about the effects of marine pollution, and the seabird populations collapses, environmental changes threaten to change the community and their way of life forever. The Faroese are among the first to feel the effects of our ever more polluted oceans; what once secured their survival now endangers their children and the Faroe Islanders must make a choice between health and tradition. The film will screen in the Blue Building at North House at 7 p.m. Free. All invited. This film is also free. It starts at 6 p.m. at the library. This is the week for the Third Annual Hygge Festival, which runs from Feb. 8-14. The 3rd annual Hygge Festival runs from Feb. 8-13, featuring lots of outdoor activities, and plenty of time to relax with friends and family. Photo by Layne Kennedy. 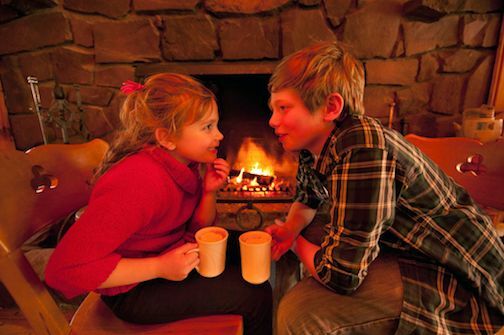 The Danish concept of “hygge” (pronounced hoo-gah) has been around for a long time. 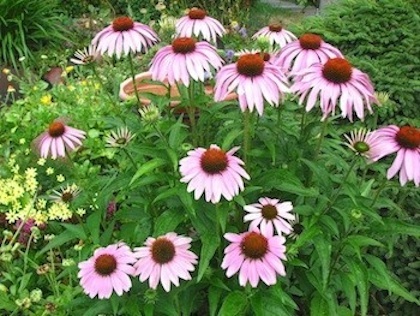 It refers to the ritual of embracing life’s simple pleasures. Feeling relaxed, cozy and surrounded by the warmth of family, friends, community and fire all encompass the idea of hygge. 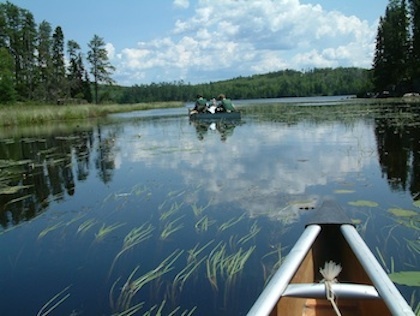 In Cook County, it also means exploring the Northwoods by skiing, sledding, snowshoeing, dogsledding, skating and more. There are lots of activities planned for this special time in winter. To see them all, click here. There are some special music events, too. On Saturday night, the Plucked Up String Band will play for a Mukluk Ball at Voyageur Brewing from 6-9 p.m., and the wildly popular band, Cloud Cult, will perform at Papa Charlie’s starting at 8 p.m. The Mukluk Ball is free. Oops. Just announced. Tickets for Cloud Cult are sold out. On Sunday, Voyageur Brewing will hold a Chalk Art event at the Brewery. 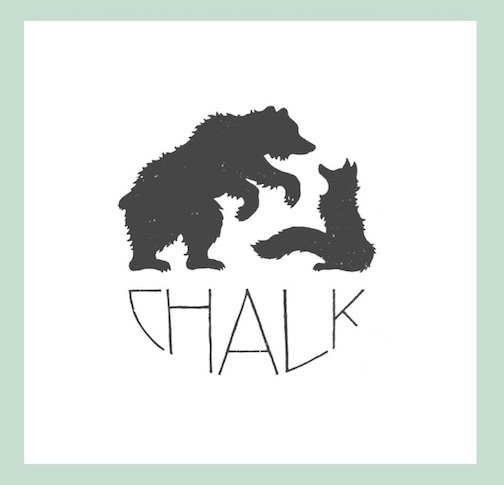 The public is invited to come watch the creation of artwork by chalk artist Max Holmgren of Bear Fox Chalk from 4-7 p.m.
Max Holmgren of Bear Fox Chalk will be demonstrating chalk art at Voyageur Brewery from 4-7 p.m. Sunday. To see his beautiful work, click here. In Thunder Bay, the Baggage Building Arts Center will hold an “Introduction to Snow Carving” during the day. 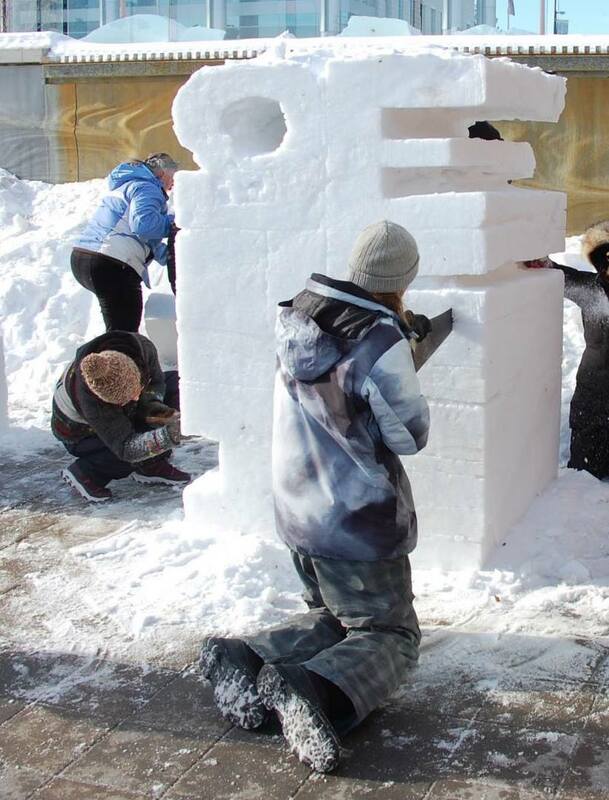 Learn how to carve a snow sculpture and make your own set of carving tools. 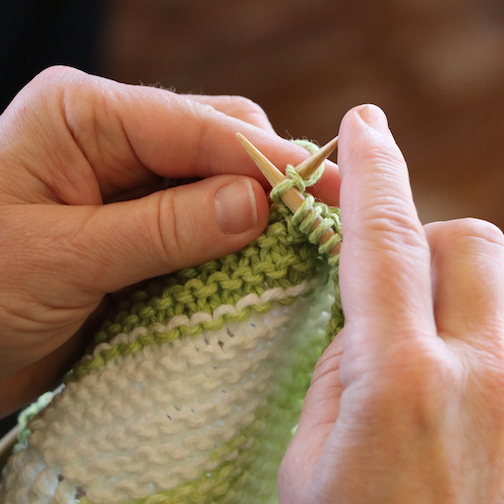 Open to adult beginners, dabblers, hobbyists, and the simply curious. Youth 13 and older may participate if accompanied by a participating adult. Space is limited. An Introduction to Snow Carving workshop will be held at the Baggage Building Arts Centre in Thunder Bay on Sunday. The workshop starts at 12:30 p.m., EDT. To register at 1-807-625-8463 with the course code: 408289. 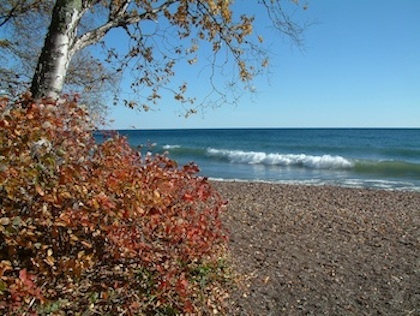 And on Wednesday, the Northern Fibers Retreat starts at North House Folk School. It’s always such a great event, featuring lots of interesting classes and workshops as well as presentations and Lunch and Learns. 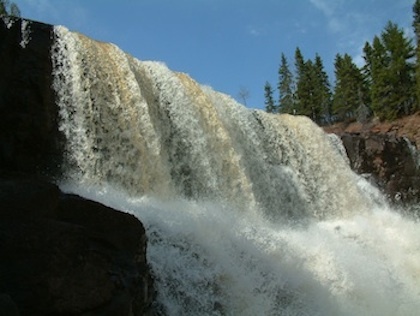 The Northern Fibers Retreat at North House Folk School starts next Wednesday. Stay tuned for details next week. Meanwhile, click here to find out more and register for classes. 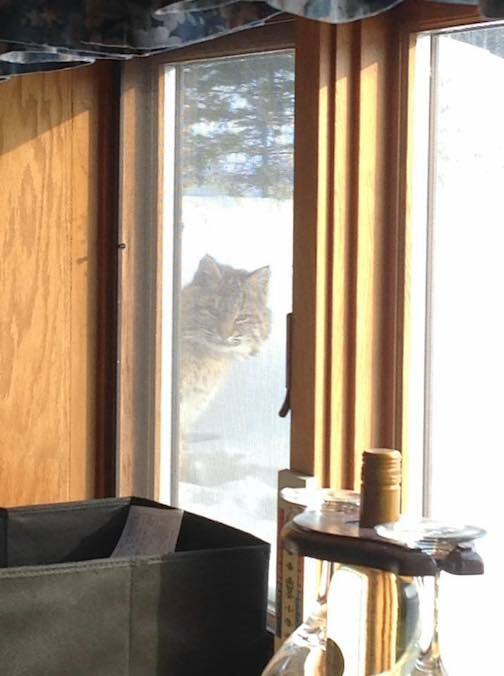 We’ve already talked about the new exhibits at the Johnson Heritage Post and Tettegouche State Park. Both worth visits. 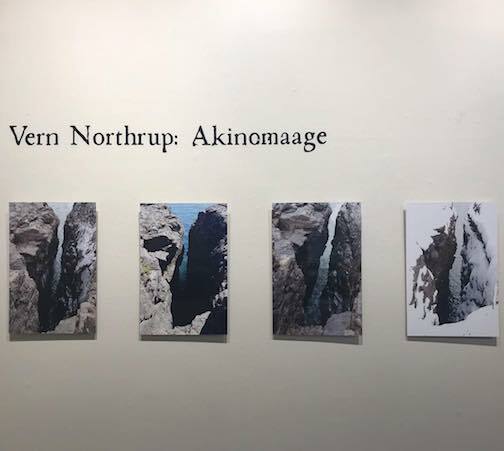 In Duluth, the Duluth Art Institute has opened four new exhibits: the Arrowhead Regional Biennial, the Annual Member Show, Vern Northrup-Akinomaage and Ray Allard, Jazz Forest. The Member Show closes Feb. 24, but all the others continue at least through March. Git Chi-gami by Vern Northrup. His exhibit at the Duluth Art Institute is entitled Akinomaage or, in Ojibwe, to gain knowledge from the earth. His exhibit continues through May 5. 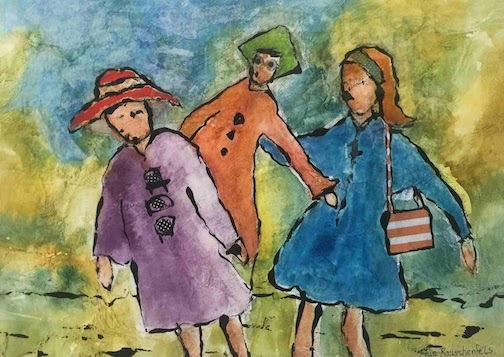 Also in Duluth, the Lakeside Gallery, 4431 East Superior St., is featuring work by Sue Rauschenfels this month. Painting by Sue Rauschenfels. Her work is being featured at the Lakeside Gallery in Duluth. In Thunder Bay, the Thunder Bay Art Gallery invites people to come and warm up as they view Riaz Mahmood’s “Burning” video series. 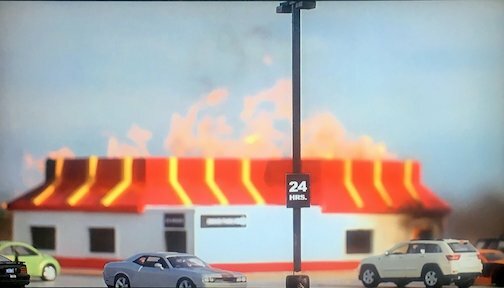 A scene from Riaz Mehmoods “Burning” video series on view at the Thunder Bay Art Gallery. 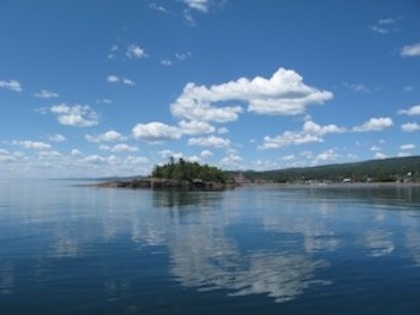 The 3rd annual Hygge Festival continues in Grand Marais through next Friday. Check out all the events here. Next Friday, Feb. 15, SVEA will give an outdoor concert (weather permitting) at Drury Lane Books featuring Swedish folk stories and songs, This event is in conjunction with the Many Tiny Lights PTA Fundraiser for the local elementary school. 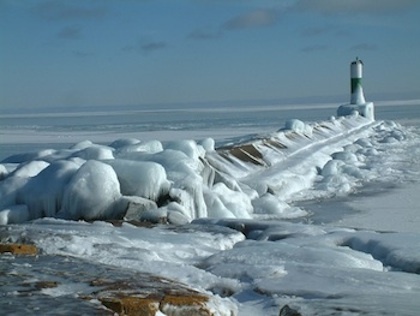 Come see the lakefront decorated with hundreds of ice lanterns. 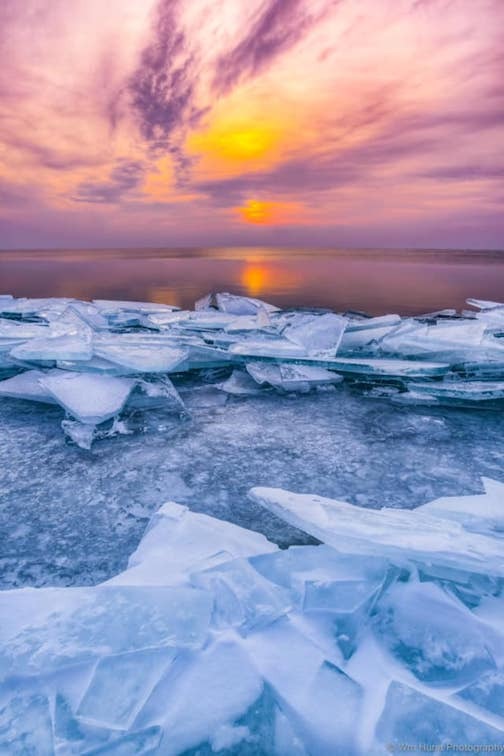 Also on Friday, Feb. 15, landscape photographer Craig Blacklock will give an Artist Talk at 7 p.m. at the Grand Marais Art Colony. He is currently exhibiting his work there. In Two Harbors, painter Bonnie Cutts will give a free artist lecture and demo at the Two Harbors Community Center from 6-8 p.m. If you plan on attending, email authenticartist@sandipillsbury.com The event is sponsored by the Two Harbors Voyageur Art Club. All invited. And on Saturday, Feb. 16, join local author and spiritual leader Mary Ellen Ashcroft for a reading and signing of her new book, OMG: Growing Our God Images at Drury Lane Books. The event starts at 5 p.m. Stay tuned. 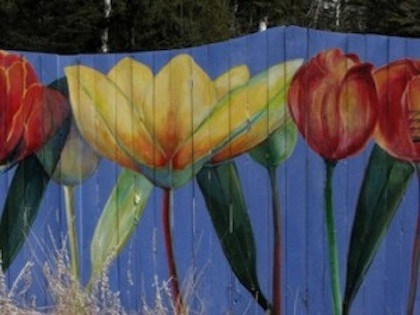 The Arrowhead Regional Arts Council is conducting a survey on artists’ needs in the Arrowhead Region. Every two to four years, the Arrowhead Regional Arts Council conducts a needs assessment to help determine its programming for the future. This year, ARAC is using a combination of methods to listen to the public, including summaries from outreach efforts, special meetings to get feedback, and this online survey. Your input is welcomed. Take the survey here. Lutsen painter Anna Hess was featured on a recent airing of WDSE’s Making It Up North. Check it out. And, if you’re curious about dog mushing and the couple who won first and second place in this year’s John Beargrease Sled Dog Marathon, here’s a great video that tells their story. Blake and Jennifer Freking live in Finland, MN. 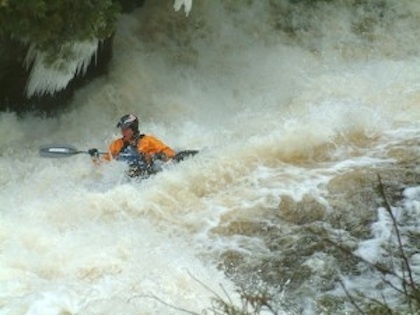 Lure of the North from Jonathan Chapman | JCP on Vimeo. Fred Anderson, Poplar River Pub, 6 p.m.
Matt Browne, Voyageur Brewing Co., 4 p.m.
Portage, Grandma Ray’s, 6 p.m.
Voyageur Brewing Mukluk Ball, Plucked Up. String Band, 6 p.m.
Christopher David Hanson Band, Wunderbar, 7 p.m. Rage N Country, Grand Portage Lodge, 8 p.m.
Shane Martin, Bluefin Grille, 8 p.m.
Jeremy Messersmith, Songwriter Series, Papa Charlie’s, 8 p.m.
Jon Kallberg, Poplar River Pub, 6 p.m.
Open Mic Night at Papa Charlie’s with Eric Frost, 8 p.m.
Pieta Brown, Songwriter’s Series, Papa Charlie’s, 8 p.m. 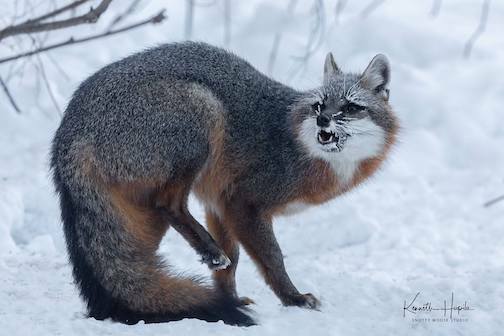 Very cold Grey Fox at -40F by Ken Hupila. 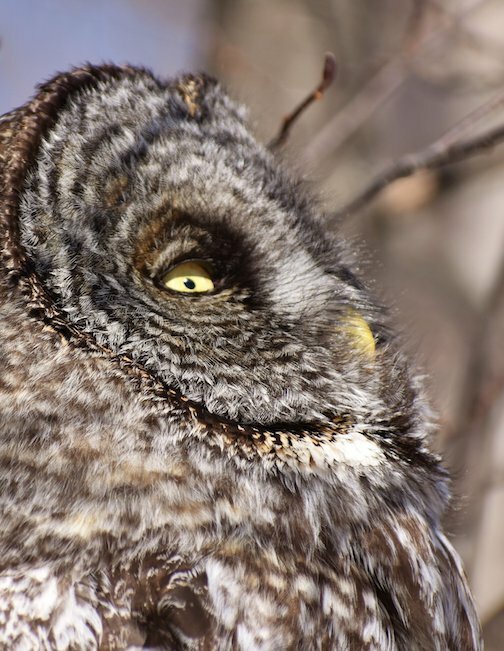 I love a sunny day, blinked the Great Gray Owl. 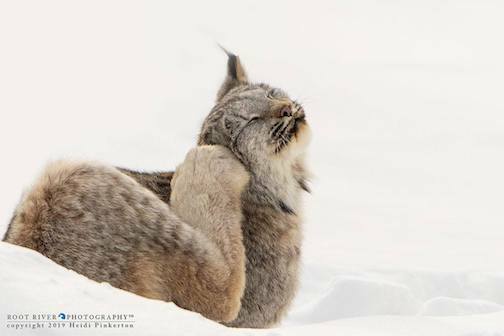 Sometimes those meaty paws are perfect for scratching that itch. Photo by Heidi Pinkerton. 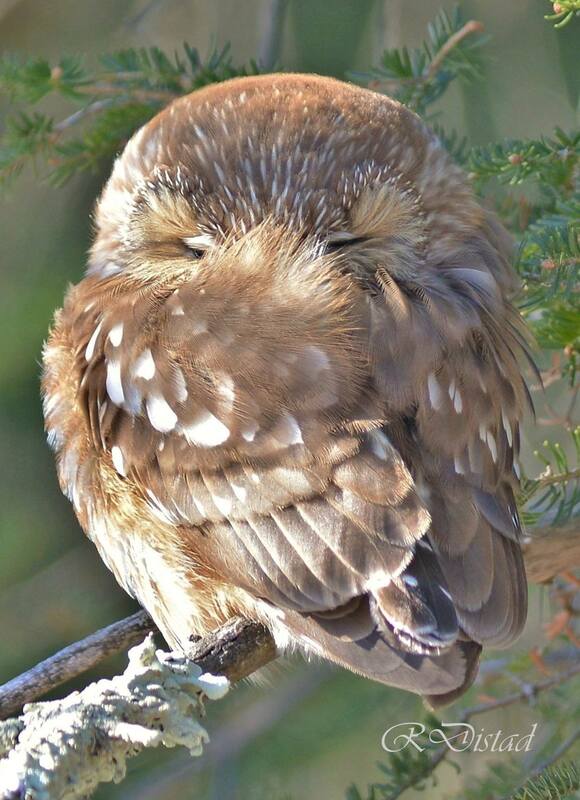 A Saw Whet Owl in February by Roxann Distad. The original Peeping Tom by Donna Strauss. And we found plenty of photos reminding us of how chilly it’s been. Artist Point by Paul Sundberg. Apparently the woman in the background was looking for her cell phone. No such luck. Gone until summer. A lovely day by Therese Misgen. Specatacular needle frost by Gary Schmies. Brighton Beach by Jeffrey Doty. 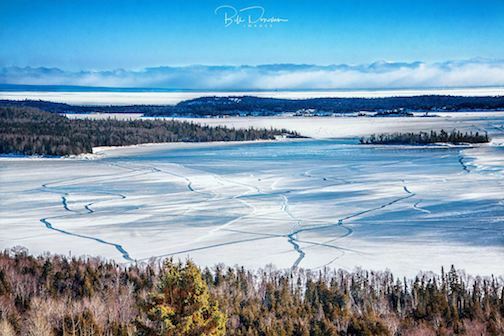 Frozen Lake Superior at the Canadian Border, Grand Portage Overlook by Bill Donovan. 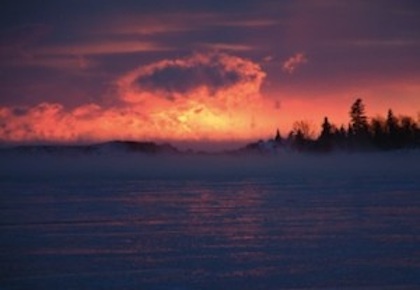 Duluth at Sunrise by William Hurst. 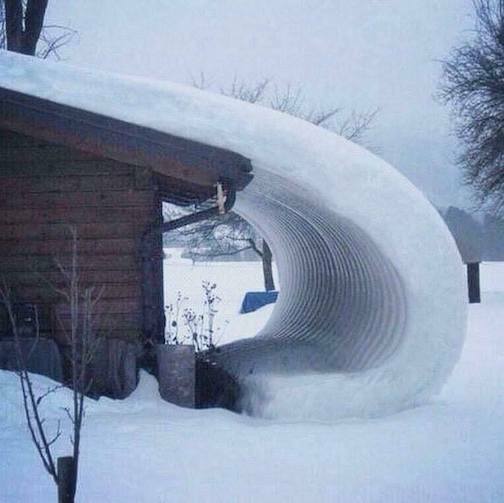 Snow wave by Tyler Howell. 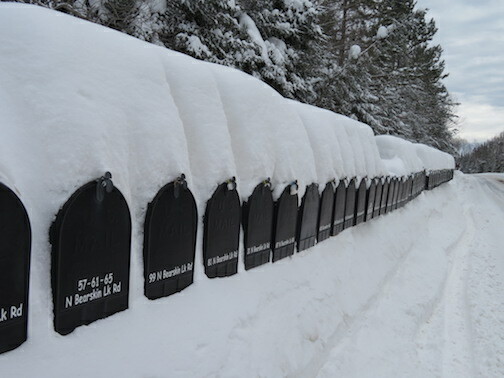 Mailboxes on the Gunflint Trail by Peggy Little. Have a great weekend, everyone. Stay warm! Next post: Be My Valentine!